The norm: "Why?" "I don't even like to drive that far." "You're crazy!" The concern: "Oh Tom, why???" (that's mom, btw). The enthusiastic support: All the questions. The smiles. "That's AWESOME!" I'd be lying if said that I didn't like being the center of attention. In fact, my running friends had seemingly given me the accolade of completing the task just upon declaring my intent. All that was left was to do it! So, what had I done to prepare? A handful of marathons over the years, some 50ks more recently and a 40 mile run on my 40th birthday a year ago. My training mileage was up and my long runs were going so well that I was very certain that I was overconfident going into this. That is until the taper...that's were the uncertainty starts to creep in. I'd given myself four weeks after my training peak. I never questioned whether I could complete the run if I were healthy, but, during that time, every little pain or crack must be indicative of something bigger. I wondered 'would I have the chance to finish?' This uncertainty peaked, with a restless night, three days before the race. After that, I just decided to be at peace with the fact that I had done all I could and I'd just have to see how it goes. This was not an empty promise. Upon entering packet pick-up, my feelings were only confirmed, that this was going to be a great race. Jen, her husband Tim and ALL the volunteers had seemingly endless energy and enthusiasm (this would continue through the entire race and awards ceremony). There was a buzz in the room as T-shirts were being freshly pressed, questions were being answered and packets being passed out. I zipped home to put the wrap on last-minute preparations; I could not wait to start the next morning. As the runners gathered before sunrise, there was a calm excitement. It's a more mellow group than your typical 5k, 10k or even marathon crowd, perhaps we're all conserving energy. The start is more relaxed also; no gun, no whistle, "The Long Haul 100 begins 5, 4, 3, 2, 1, now." The course was essentially a 16.67 mile out and back repeated 6 times. There were varied surfaces including some asphalt path, packed crushed shell as well as some softer spots of sand and pinestraw covered trail with roots and tricky footing. The first lap, everyone was getting to know the course and concentrating on running slower than you might think you have to. This provided a great opportunity to meet all kinds of runners: other first timers to long-time ultra veterans, runners from as close as Florida and neighboring States to as far away as Israel. Everyone was friendly and I learned as many names as I could. Throughout the race I tried to support every runner I passed by name, with a positive comment or at least a smile. Just about every other runner did the same! As the laps ticked off, it became all about support. From start to finish, it would be hard to overstate the role the race volunteers played; their smiles, energy, enthusiasm, helpfulness and encouragement made it easy to keep moving forward in a positive state of mind. Never underestimate how much help it is, after 40 miles, to have someone fill your water bottle and screw the cap back on for you! I have no doubt that this comes top-down from race director, Jen Pearson; her husband, Tim; and the cause for which the race sprang forth. Tim and Jen were in the process of adopting two boys from Haiti when the earthquake hit in 2010. The boys were, amazingly, unharmed and had a new life and home in Florida 10 days later. Money raised from the Long Haul 100 goes to Praxis Haiti, their non-profit, dedicated to changing the lives of those that remain in Lavanneau, Haiti. I had originally just signed up for the race, but have become very glad knowing that I was able to participate in helping such a great cause. Palm Harbor Running Group can make some signs! While the race volunteers make this a great race for anyone who is unsupported (a perfect first 100 miler if you're thinking about it), this was not the case for me. Being a local race for me, I was fortunate enough to also have friends and family come out and cheer. 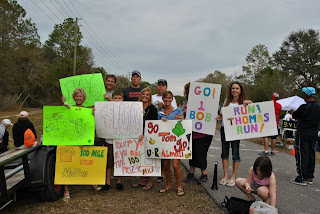 My wife, Amber, set up camp and, over the course of the race, no fewer than 30 people including my family, friends and fellow running club members (check out Palm Harbor Running on facebook) came out to cheer, wave signs and otherwise make merry during the long periods between when I came running by. A big group greeted me at mile 50 and from that point took turns pacing me through the night and to the finish. I can not even begin to imagine what the race might have been like without their cheerful conversation, sharing of headlamps, calling out roots and holes through the night and providing little bits of information, humor and motivation. All their support in the months leading up to the race, the pasta dinner they put on for me and then showing up in such big numbers to what is inarguably not the most exciting of spectator sports reinforces my belief that runners are some of the best people on earth. As for the race itself, the first of the six 16.67 mile laps was relatively quick despite my best efforts to take it out slow and chat with everyone around. Even though I'd run 50k many times in training and races, around mile 25 it seemed that this would be a long day requiring a substantial effort; I really expected not to feel this way until closer to mile 60. The pace slowed throughout the day as the temperature approached 80 degrees; with more experience, I probably would have eased up a bit during the heat of the day. Fortunately, the temps cooled quickly when the sun went down and even though the pace continued to slow as my walking increased, my legs felt like they had more in them. With my pacers, I tried to keep the walking to a minimum and push the pace when I could. The challenge at this point was the sharp pains that seemed to move around from the right knee to the right groin, left knee, left groin. This, of course, in addition to the constant pain and exhaustion with which I'd now become very familiar. Dare I say, however, it wasn't as hard as I expected it might be, I was able to stay very lucid and never had a real 'dark time' that so many talk about. Though I took frequent walking breaks, I never had to stop. I was ecstatic to be finishing up my last loop as the horizon began to glow of morning and accomplishment. As I reached the finish line, the clock read 23 hours, 38 minutes, 28 seconds. Sub-24 hours! For all the unknown and all that could have gone wrong, a perfect result. 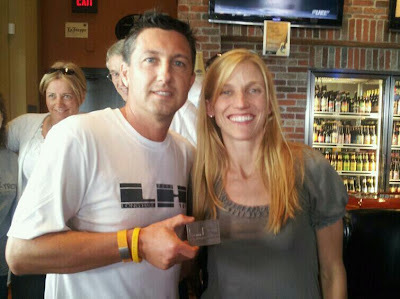 Thomas Grinovich receiving the coveted finishers' belt buckle from race director, Jen Pearson. Just to keep this in perspective, I was 12th place, very much middle of the pack. The race winner, Mike Morton, finished in 13 hours, 18 minutes...yeah that's fast, true greatness...I'm guessing when he finished, I still had 33 or so miles to go. Either way, I had enough energy upon finishing to hang out at the finish line until cut-off to cheer in the remaining runners. The fun continued at an awards ceremony at the local World of Beer. It was a perfect way to wrap up the experience with good food, beer and company. Everyone was so friendly and inspirational, it was such a pleasure to meet everyone, hear about their races and what they had planned next. I felt very much a part of a new club and although I kept saying that I would have to see how my recovery went, truth be told, it was only seconds after I finished that I was already thinking about how I could improve my next attempt. I don't imagine I'll ever forget my first 100, but I can't wait 'til the next one either! Tom...I loved reading this. You are such a humble, inspiring guy. I am so glad I could be a small part of the cheering section. Run and Blog on! Great achievement and great race report! Was indeed an awesome event. Thanks, Raanan! Great meeting you, do you come to the States to race regularly? Hope to get a chance to chat more next time. Great write up and congrats on your sub 24! I plan to run Long Haul as my first 100 miler in 2020. The 8th Motive: get it. give it. live it!